Horizon 2020 is the financial instrument of the European Commission that runs from 2014 to 2020 with an €70.2 billion budget. The EU’s new programme for research and innovation is part of the drive to create new growth and jobs in Europe. 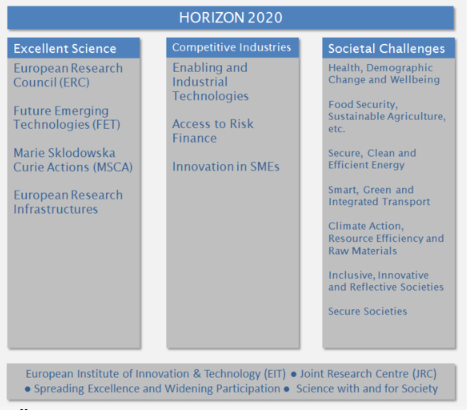 The first Horizon 2020 Work Programmes will cover 2 years 2014-2015 and will include all thematic areas. The respective Calls have been published on 11th December 2013. The part referring to “Health, demographic change and wellbeing” includes the topics of most relevance for you; however, we highly recommend to checking also other related thematic areas that contain health-related topics. The part referring to “Health, demographic change and wellbeing” gives a detailed description of the topics open for the first calls. Based on the information from the draft work programme you might start already with first preparations and most importantly present your expertise profile and /or search for partners in our database. Taken together Horizon 2020 with its new funding schemes and with its more attractive and less complex funding rates will offer many incentives to health-related SMEs to apply for European funding. In Horizon 2020 there will be 2 main types of Project or Action. There will be “Research Projects” and “Close to the Market Innovation Projects”. Research projects will be entitled to 100% Direct Costs with a flat rate of 25% Overheads added on top. Innovation Projects will be entitled to 70% Direct Costs with a flat rate 25% Overheads added on top. Currently, there will be no Full Costs Overheads option available. Co-ordination and Support Actions (CSAs) will continue to be funded. Most of the Projects will claim to be reimbursed via the Eligible Costs method however some Actions such as the Marie Sklodowska Curie Actions will use Flat Rates and be paid via the Lump Sum method. Horizon 2020 introduces new SME instruments for highly innovative SMEs. The SME instrument is targeted at all types of innovative SMEs showing a strong ambition to develop, grow and internationalise. It provides staged support covering the whole innovation cycle in 3 phases complemented by a mentoring and coaching service. Transition from one phase to the next will be seamless provided the SME project proves to be worth further support in a further evaluation. Each phase is open to new entrants.